I received this book via . This does not affect my opinion of the book or the content of this review. 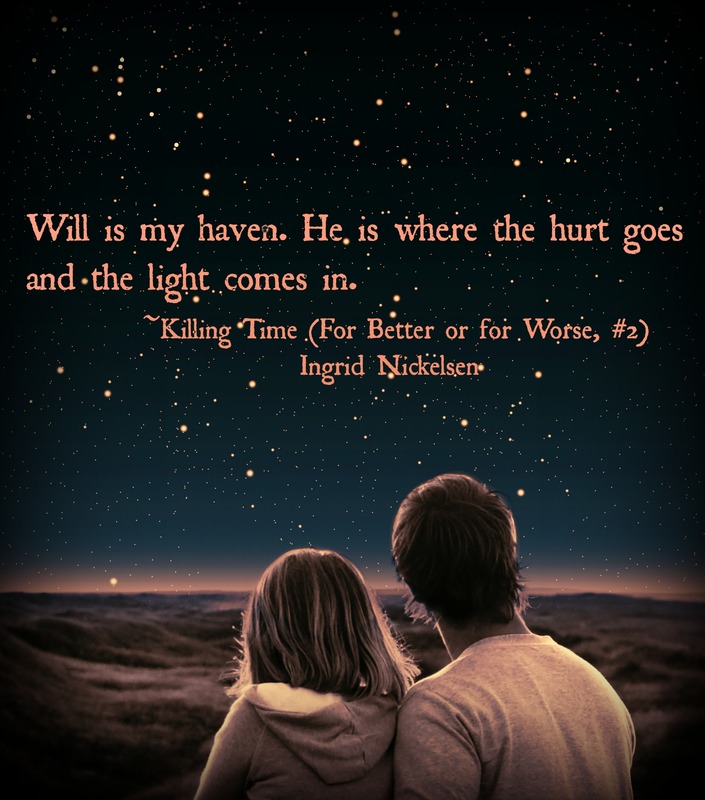 Killing Time by Ingrid Nickelsen is the follow-up to her debut novel For Better or for Worse and picks up immediately where the story left off. (SPOILER NOTE: If you haven’t read book one, there are minor spoilers in this review) Evangeline has not transitioned and is running to her old section in the hopes to warn Will about James’s betrayal. Joining with the Wanderers, Eve sets off and ultimately she must chose between Will and Josh, but who and how will she chose? Back in section 47, Will is mourning Eve when the Midnight Riders appear and take him. Now he along with Brielle must find a way to escape, but at what cost? I waited a year for this book and I have to say it did NOT disappoint! Eve is the same girl I remember: strong, independent with her own view on this in-between world. She’s also extremely heart-broken. Her memories are back. She lived an entire lifetime with her husband Josh after her first-love Will died in a tragic accident. Now how is she to chose between the two of them? I can’t imagine how hard this choice is for her and easily empathized with her. Will is different than I remember him. Maybe it’s because I know who he is now and I had such high expectations for him. I was in love with him during book one, but that all changed this go around. He has this hero-complex going on and it’s what gets him into trouble. It cost him his life and now it may cost him his soul too! Then there’s Josh ❤️ I adore him and am #TeamJosh all the way! Josh is Eve’s husband in life and in death. He’s sweet, devoted, and reminds me of my own husband. Maybe that’s why I love him so much 😉 He follows Eve when she doesn’t transition even though he knows why she didn’t. He loves her and follows her and helps her throughout the book. Is that not love or what?! The plot of this story is two fold as it is told in dual, alternating POV. Eve is set on finding and saving Will. Will is set on a new, darker path as he becomes engrossed in the Midnight Hunters’ world. The plot is dark with lots of twists and an absolutely heart-breaking ending! If you enjoy young adult, paranormal romance, and some fun afterlife fantasy than this book is for you! When she arrived in this land after her death with no memories of who she used to be, I had to be the one who reminded her of us. Of our love story. It used to be the most beautiful thing life ever gave me, until destiny changed her mind and fired a bullet through my perfectly happy heart. Death gave me wings too soon, but I’ve never allowed myself to fly. I’d never wanted to be set free… Not like this. I broke about a thousand rules and waited for her in this in-between. I’ve met Eve every single night and watched little pieces of her being slowly put back together. I’ll never let myself forget the way she looked at me when she finally remembered me. The last piece of the puzzle. I didn’t think she would agree to leave her section and complete her transition. She’s always been so stubborn. Well, maybe she has changed over the years. Her husband Josh must have tamed her temper a bit. I smirk at the thought of him. If the poor guy knew about us… I wonder if she told him. Probably not. Even if she did, I don’t really care. He had more than fifty years with her, but it should have been me. I smirk again. No, maybe he shouldn’t know about them. I lie down to gaze up into the starless sky. I can’t believe I lost her, again. She’s really gone this time. There is a tour-wide giveaway for a $20 Amazon GC, click the image below to enter! OMG this book seems like a tear jerker. (or maybe I’m just reading into it wrong?) It’s like, I want to read it but then I’m like… should I? I dont necessarily need a happy ending but I don’t want a heart wrenching ending either. 0_o dilemas. Well for some it may not be as heart wrenching as it was for me 😉 I definitely think you might enjoy the series though. There’s a cute bad boy you’ve just gotta love!